← Aberystwyth University students perform Manning play for family members. Donations collected for Family Fund. 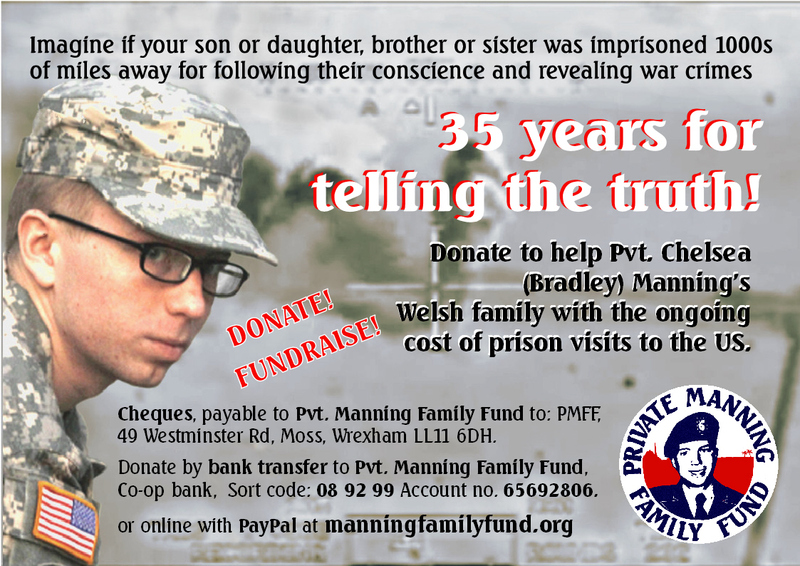 Private Cheslea (Bradley) Manning’s Welsh mother, two aunts and an uncle will return to their roots and spend the next few days in Dublin, birthplace of their late father, where supporters are organising a series of events and meetings to raise awareness of Manning’s plight and of moves to help the family with the cost of Transatlantic prison visits now and (unless Manning is pardoned and released) the years ahead. £1,000 has already been given to the family from this fund towards the cost of their next visit. The Justice, Peace, Human Rights & Sustainability organisation Afri Action from Ireland is co-ordinating the visit and has set up a series of meetings that will bring the visiting family members to meet human rights groups, lawyers, politicians, the media and others.